On Monday and Tuesday I spent some quality time with my favorite eight and nine year olds. We decided to do some kitchen experiments! 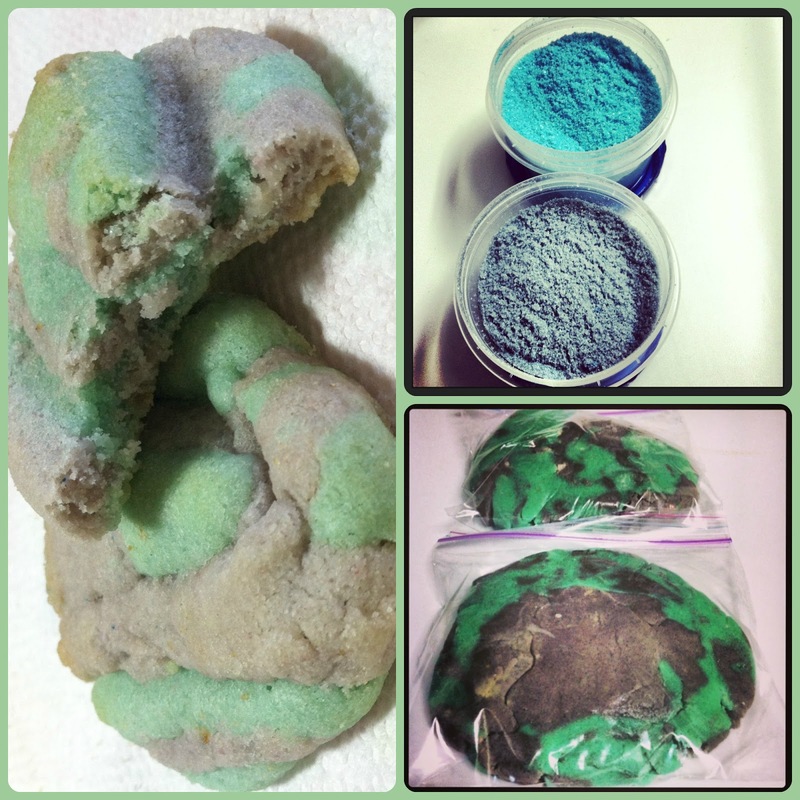 Monday was Scented Playdough (that post is coming soon) and Tuesday was dying sugar and making Crazy Colored Cookies! 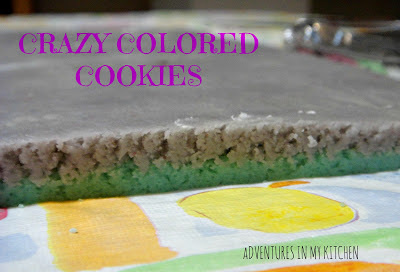 These cookies were super easy and kid-friendly, plus I had all of the ingredients in the pantry and fridge! All it took was some sugar and some food coloring to get started. 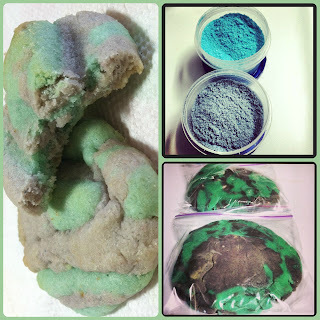 As you can see in the first picture we did a blue sugar and a purple sugar and then used that sugar to make sugar cookie dough. For some reason, the purple turned a kind of grey color, and then blue turned green. The only thing I can think of is that the butter was yellow and that may have contributed to the color change? The finished product kind of reminded me of Sully from Monsters Inc. Appropriate since Monsters University is coming out soon! We made two batches of dough- one "blue", one "purple". The idea was to make kind of pin-wheel cookies. Well, our dough became warm really fast so we ran into some issues. We did get some pinwheel cookies, but laying the dough on top one another was a challenge! Once the two colors were layered I cut the dough into a giant rectangle. With the extra dough that was cut off the extras I just made giant dough balls and stuck 'em back in the fridge. It like of looked like camo cookie dough. Once those balls were really chilled, I just cut little squares and put the squares on the baking sheet. 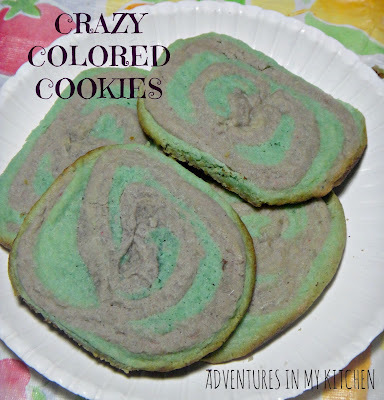 This created little bite sized multi-colored cookies. These are fun and great for kids! Colored Sugar- kids loved this part! 3 cup sugar- divided into 2 containers. Separate your sugar into containers with tight fitting lids- 1.5 cups in each. In each container drop food color drops. Start with 2 or 3 drops, you can always add more but you can't take away! Shake each sealed container for about 1 minute to distribute color. Cookies- you need to make 2 batches, one for each color. preheat oven to 375*, line cookie sheets with foil. in a small bowl mix all dry ingredients. in a medium bowl cream butter and sugar, then add egg and extract and beat. a little at a time pour dry ingredients into wet ingredients and mix thoroughly. Dough will be sticky, chill in the fridge for 20-30 mins if it's too warm. *Repeat with the second sugar color. roll out each dough and place one color on top of the other. Trim the dough into a large rectangle. 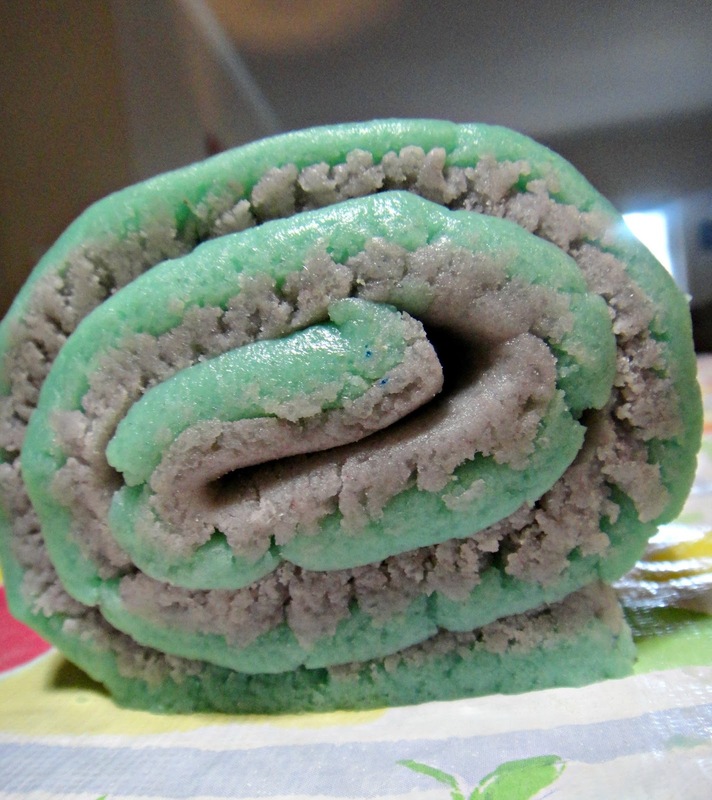 Roll like the picture above, wrap in plastic wrap and chill in the fridge for about 45mins. After it's chilled, slice and place on ungreased cookie sheets. Bake for 8 mins. Let cool on cookie sheet for 2 minutes before removing onto a wire rack. Combine the two colors of dough with your clean hands as you like. Chill in the fridge for about 20-30 minutes. 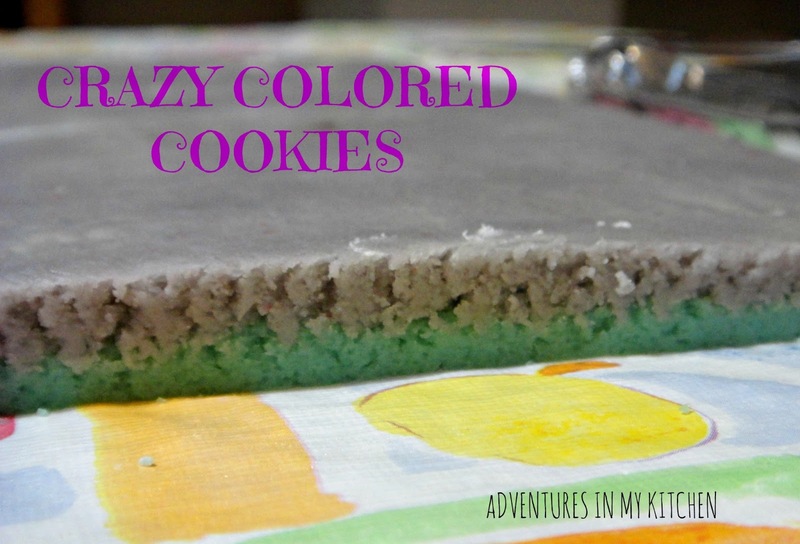 When they're chilled, cut the dough into little rectangles and place on an ungreased cookie sheet. Bake for 8 minutes. Allow to sit on the cookie sheet for 2 minutes before removing to a wire rack.